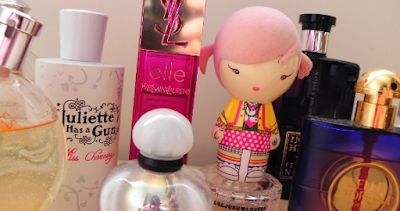 If you love perfumes then this is the post for you! Over at Escentuals Blog they have compiled a wide range of bloggers first fragrances and there signature scents. Here's my own little snippet from the post but make sure to read the whole post with a nice cup of cha! "Looking back my first ever choice of fragrance was actually quite odd! I would of been around 13 and in a duty free perfume shop at the airport. I remember testing so many over powering perfumes and then I came across Petits et Mamans by Bvlgari and compare to all the rest it was just soft and chamomile like. At the time I didn't realize that it was actually a fragrance for mothers and there babies! But never the less I spent around £25 and came away quite happy with my first ever fragrance purchase. I've never really had a signature scent as such, as I love so many different perfumes. Though I definitely has key scents for each season - Spring has to be 'Lovely' by Sarah Jessica Parker and 'Tuberoli' by Space NK (now sadly discontinued) . Summer has to be 'True Star' by Tommy Hilifiger and 'Eternity' by Calvin Klein. As for winter I love deeper scents like 'Eau De Star' by Thierry Mugler and Prada Amber." What scent will you be wearing this Summer? I've been changing to my perfume for years and years I never bought the same one twice however this year I discovered J'adore by Dior, it is such a classic scent and I think perfect for all year round. I can imagine myself growing old and still having a bottle on my dresser! @Carla - My mum wearing J'adore so I know exactly what you mean! It's just such a lovely scent and like you say it's perfect for all year round. Just a timeless classic. @Martje - Thank you for your comment - such an interesting read and such a good idea! I've actually smelt all 3 fragrances you mention and can't actually related the scents to the destinations you have been - so you have clearly picked well! Just such a lovely way of remembering your holiday. I wonder what you will pick up at JFK! I remember my mum taking me shopping to buy my very first perfume when I was younger. It was 'Tommy Girl' by Tommy Hilfiger, and I felt so grown up when I wore it! Ever since then, even though I experiment with different perfumes the only perfume I keep going back to is YSL's Cinéma. I bought it on my first trip to Paris, and every time I wear it I think of Paris! Haha I actually used Tommy Girl as well, but I always thought it wasn't feminine enough to suit my tastes. So it's sitting on my shelf right now. I currently use Coco Mademoiselle - the edp lasts soooooo long, I pretty much need one spray to last me the entire day. So although it's expensive, the time it lasts means I'm getting my money's worth! I recently discovered those Gorilla perfumes at Lush. Most of them smell horrid like chemicals, but Imogen Rose is amazing, especially when you give it time to soak into your skin and give off a more unique-to-you scent! I've recently bought a few perfumes. I got Harajuku Lovers Baby (same one as your picture), I absolutely adore it. It is a gorgeous sweet uplifting scent, makes me feel happy. I also got Katy Perry Purr, long lasting and I think quite a fun and feminine scent. It also for some reason reminds me of Rome, no idea why or what it is about it that reminds me, maybe I smelt a similar perfume there. Today I am wearing Miss Dior Cherie and I am falling in love with it. It is such a feminine fragrance, sweet but not overly so on my skin and the patchouli in the bottom notes gives it a bit of an edge. I also love Benefit So Hooked on Carmella, vanilla coconutty goodness. I'm not a big perfume fan because I have so many body scrubs and lotions that are scented already. However I just bought Molton Brown's Heavenly Gingerlily fresh frangrance and it is beautiful! Funnily enough, I haven't tried any of the fragrances you mentioned! My first perfume was probably DKNY Be Delicious. I remember how much my boyfriend loved it, & also how I rarely wear it anymore. Definitely need to pick up a new bottle!